Brexit means Brexit. Quite what Theresa May meant by that is still a little unclear but whatever Brexit is I’m sure most of us are pretty sick of it by now. Fox hating racist Nigel Farage drinks another pint, Boris Johnson graffiti’s another bus and the internet descends into one big, red-faced argument forever stuck in caps lock. Newsreaders restrain themselves from screaming into the camera lens in a blind, terrified yet strangely titillated panic “what the hell’s going on! ?” One big, confusing and seemingly never ending mess. Yeah, well done Dave. Good job Theresa. When and if the dust settles historians will no doubt note that the one good thing to come out of Brexit, the one thing we could all agree on, was Virtue Signals, the wonderful new album by Steven Adams & the French Drops. An album that tackles the political climate yet does so in a very human and empathetic way. It’s an angry album in many ways, just one dressed up in gorgeous melodies and life-affirming indiepop. We might all be heading for the end of days but at least we’ll have some decent tunes to listen to as the bus, in a comforting and nostalgic nod to The Young Ones, finally rockets off the edge of the cliff. Happy days are indeed here again. Adams used to front The Broken Family Band, a wonderful and rather underappreciated group that mixed country, indie and dark humour to perfection. After disbanding, Adams went on to form The Singing Adams and has also released a couple of solo albums. Whereas The Broken Family Bands’ highpoints often felt personal and introspective (ok, maybe not ‘Don’t Leave that Woman Unattended’), Virtue Signals is an album that looks out to the world for its inspiration. ‘Bad Apples’ addresses those patriotic bulldogs and seaside elites that “need to divide us” with a big, shiny slice of indiepop. What could have come across as simply angry (I can almost hear the internet shouting “re-moaners” at me right this minute) is in fact a compassionate rallying call. The summery jangle of ‘Paul’ comes next with its beautifully melancholic coda “I give it all away and I’m empty inside”. A little sad perhaps but always hopeful. ‘Ex Future’ is markedly more pissed-off, stepping up the urgency in the process. The words providing snippets and imagery of the political landscape with Adams asking, “You did all those things/ how do you look yourself in the eye?” Adams songwriting has long since shed its overt country influences yet remains distinctive, catchy and smart. It’s exciting to hear just how well his songwriting works with this kind of subject matter while his new band, it has to be said, sound utterly fantastic. ‘Last Century’s Man’ is my contender for the albums finest chorus, it’s almost Bowie-esque verse giving way to a euphoric yet characteristically melancholic chorus, “hard times/ well everything’s relative/ whoever said it would be easy/ they didn’t know anything”. The lovely ‘Imprinted’ takes a few minutes for a little well-deserved romance before tackling loneliness with the gentle ‘Wolves’. The latter acting as something of an outstretched hand to the listener. The band tries their hand at a number of styles throughout the album yet Virtue Signals feels brilliantly taught and coherent throughout. Not quite the ‘Brexit themed rock Opera’ the band has joked about but an album with a message and mission nonetheless. The breezy, gorgeous pop of ‘A Joke’ leads seamlessly into Krautrock-influenced belter ‘Free Will’. 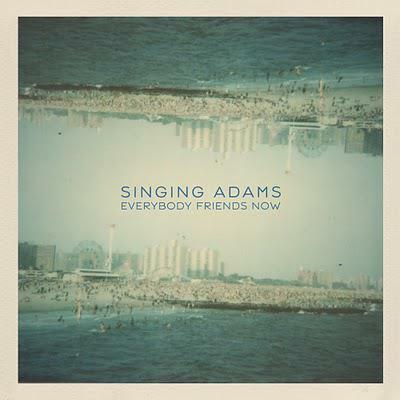 A world of choosing sides and a place where “everybody’s scared”, the song delivers the final blow as Adams sings, “you with the flag, you look tired”. The album ends with the utterly sublime ‘Desire Lines’. Here is an album that fully acknowledges the hard times but resolutely refuses to give up hope, reminding us that “all we have are these moments of joy”. A moment of calm amongst all the uncertainty and a plea for togetherness. It’s a sentiment that feels particularly important right now, they should seriously think about handing it out through the NHS. An album about trying to make a genuine connection in a sea of emoticons. But nowhere near as grumpy or as brow-furrowing as that makes it sound. Give yourself a break from the news and give Virtue Signals a try.